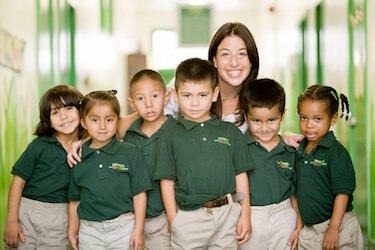 KIPP Raices founding principal Amber Young Medina and students. The report was funded by the Michael & Susan Dell Foundation and developed in partnership by the foundation, Education Cities and GreatSchools. The report’s methodology gathered data from 2011 to 2014 and compared statewide standardized test scores from low-income students with their more advantaged peers. “The findings from the Education Equality Index clearly illustrate the large achievement gaps plaguing our K-12 education system. Nevertheless, many schools are making significant strides in providing high-quality opportunities to all children, regardless of their socioeconomic background, and charter public schools are leading the way,” Nina Rees, president and CEO of the National Alliance for Public Charter Schools, said in a statement.